Another one of Mom's favorite places to dine is Monkeypod. I just didn't know why. I went when they first opened, and wasn't amazed. Sure, their Kale Salad was good but I wouldn't drive all that way for "ok" food. Then, years later, about a couple weeks back, I gave it another try after Mom's once again, "rave reviews." Whenever she needs a little getaway, she drives all that way to have the Poke Tacos accompanied by a nice glass of wine. Dad was away on a trip, so I decided to join Mom for a nice lunch before I played some golf later that afternoon. I ordered Monkeypod's infamous Mai Tai to start. WOOOO, boy is that drink dangerous! Dark and light rum plus a delicious honey-lilikoi foam. Mmmmm! I warn you it is strong, so be sure to drink some water with that drink! Next we ordered a couple dishes to share. Mom couldn't go without the Poke Tacos (and I was curious to try it too!) and also the Bourgeois wood fired pizza, which is topped with Big Island Lobster, Hamakua Wild Mushroom, Garlic White Sauce, Parmesan and Thyme. Really amazing combination. The lobster was surprisingly ultra tender, not rubbery at all! I would definitely get this next time with the Poke Tacos! What was also nice was that the bartender was generous enough to give us some sample tastes of wine that we were curious about. I find small things like this have a big impact on return clients. And well, we'll definitely be back. Verdict? My mind has did a 180 for Monkeypod, thanks to Mom! I will definitely be back for that deliciously-opulent Lobster Mushroom Pizza, and I'm definitely trying the Pod Thai drink complete with all things Thai- Rum, Creme de Coconut, Lime, Lemongrass-Cardamon Syrup, and Thai Basil. Yum! 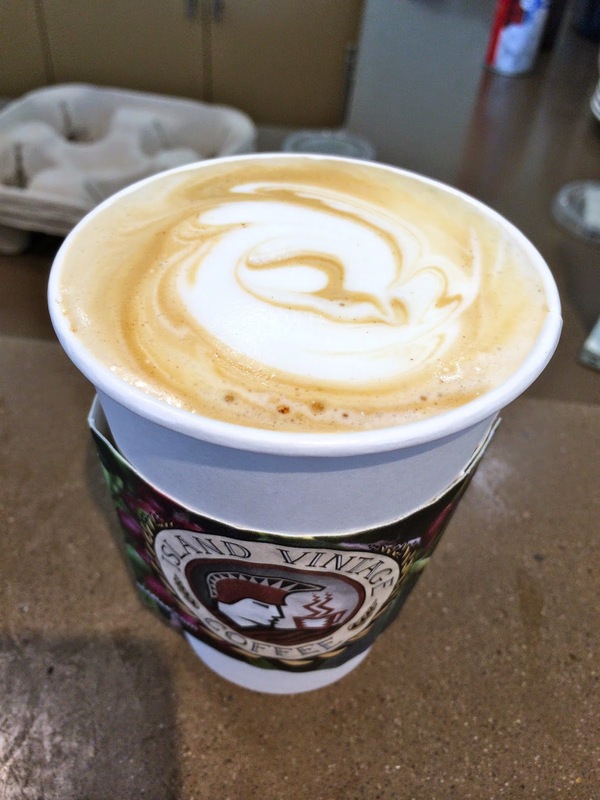 Stop by Island Vintage Coffee right next door to Monkeypod to have a sweet Hawaiian Honey Latte after lunch or dinner!